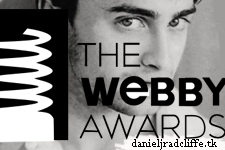 Home » Daniel » Updated: Daniel Radcliffe to present at the Webby Awards? Updated: Daniel Radcliffe to present at the Webby Awards? Well.. I found a tweet on twitter which made me want to search for more information on the upcoming Webby Awards this monday at the Hammerstein Ballroom. jimshi809 posted the following: "Daniel Radcliffe is confirmed to present Anna Wintour with Vogue.com’s Webby for Best Fashion Website on Monday at the Hammerstein Ballroom"
Another source is reporting the same thing, but for as far as I know there hasn't been any confirmation to this, so I say let's see this as a rumor, for now. When we know more you hear it here! Update: 9th June 2011. It's confirmed now that Daniel will be there, because The Webby Awards tweeted about him. So don't forget to watch it live this Monday after Sunday's Tony Awards. RSVP to watch The Webby Awards LIVE on Facebook on June 13th, featuring appearances by LCD Soundsystem, Daniel Radcliffe, Angry Birds, IBM’s Watson, Founder of the “It Gets Better” Project Dan Savage, and musical performances from Norah Jones and the Gregory Brothers.